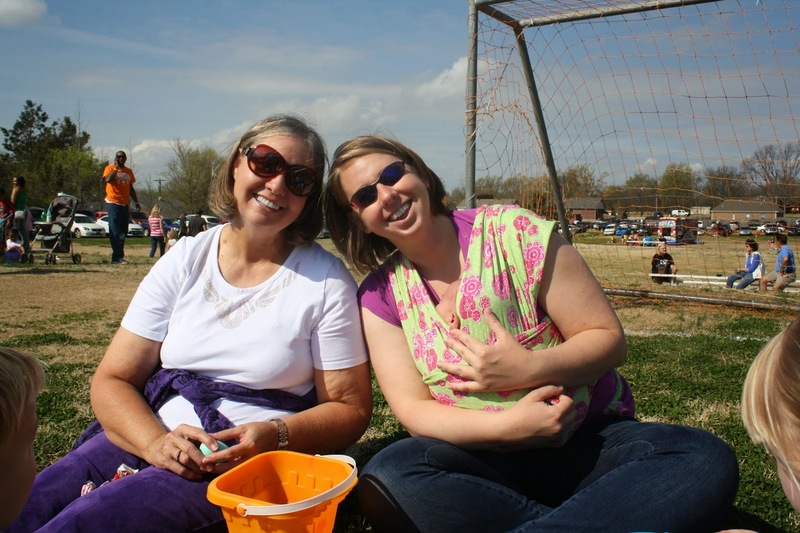 One of the ladies in my MOPS group shared information about the Munford Egg Drop so we decided to go. 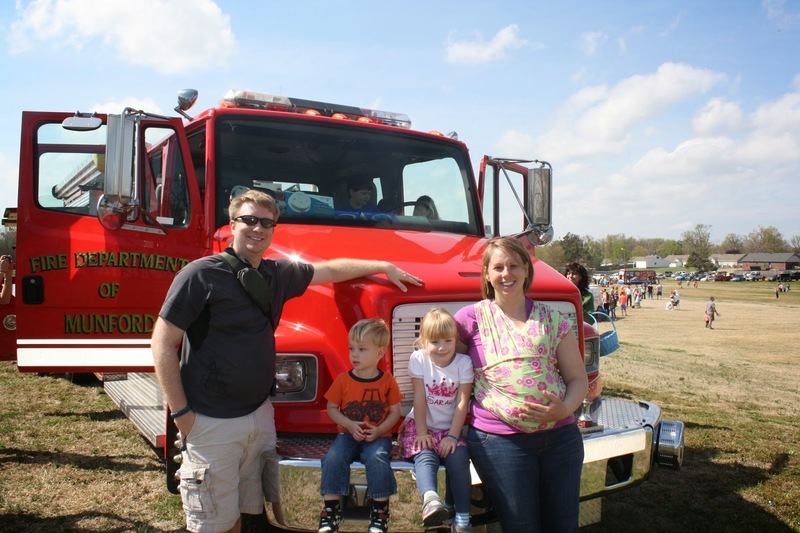 The word I heard was that they drop Easter eggs out of a helicopter for the kids to collect. 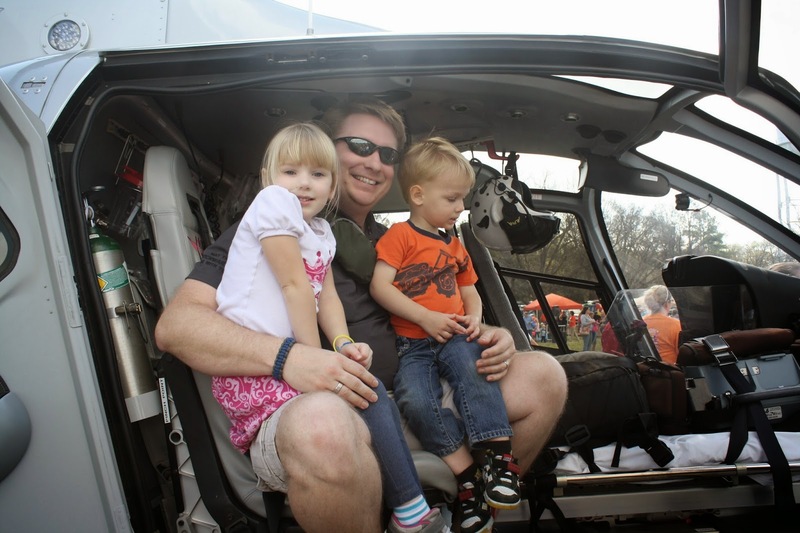 My kids love helicopters so this sounded awesome. Plus I was pretty curious how all this would work. Someone in the group said they buy special prefilled eggs for this so that they don't bust open. It turns out that was a hilarious lie. All the eggs broke open as they pelted the ground. It was hilarious! 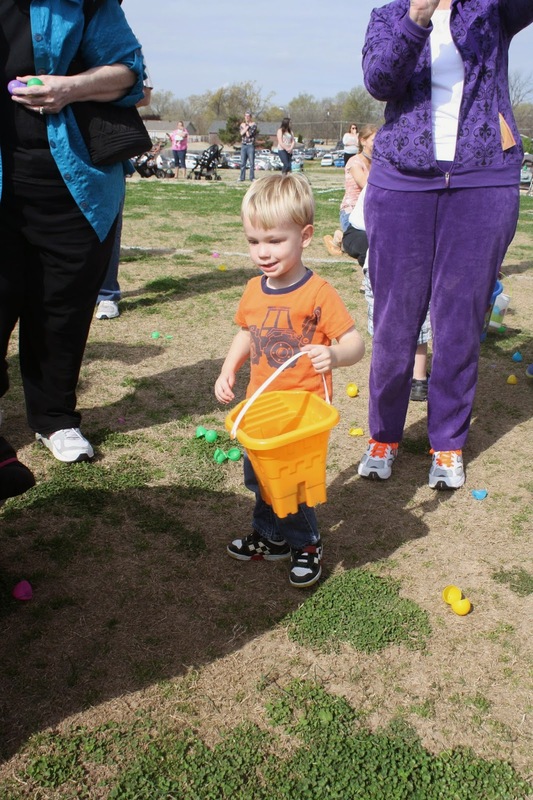 It was a well organized city egg hunt. 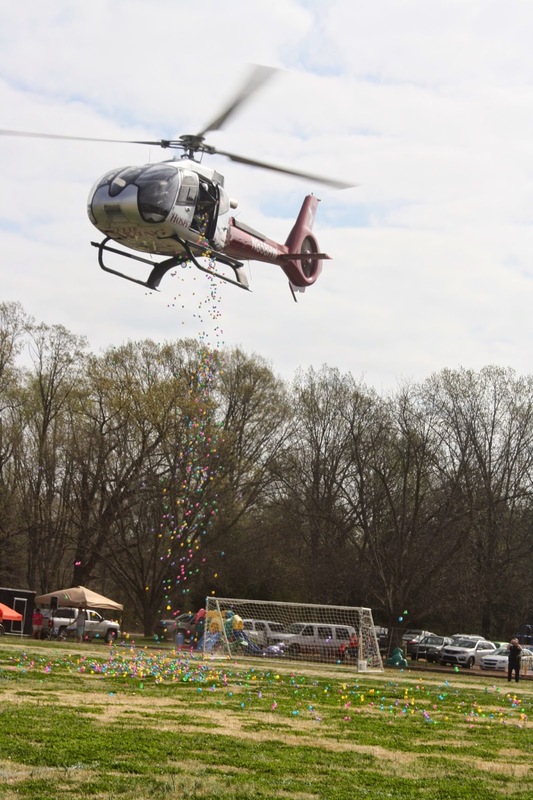 They had it organized into age groups and after the helicopter dropped all the eggs and the propellers scattered them all over the field they pulled orange netting up to keep the groups separated. I thought that was a pretty good idea. Sarah and Cody are in different age groups now so Chris took Sarah, and my mom took Cody, and I had Charlie and the camera. 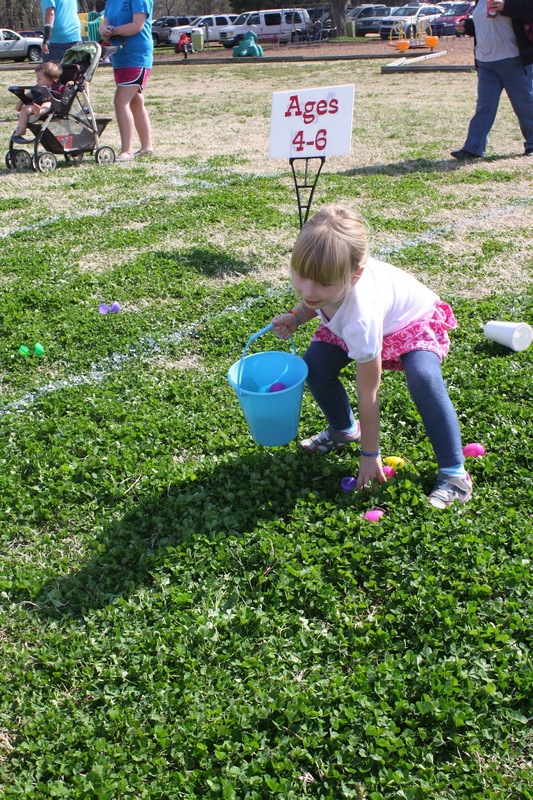 Dropping the eggs and exploding candy all over the soccer fields. And yes, Cody is using a sand castle bucket. 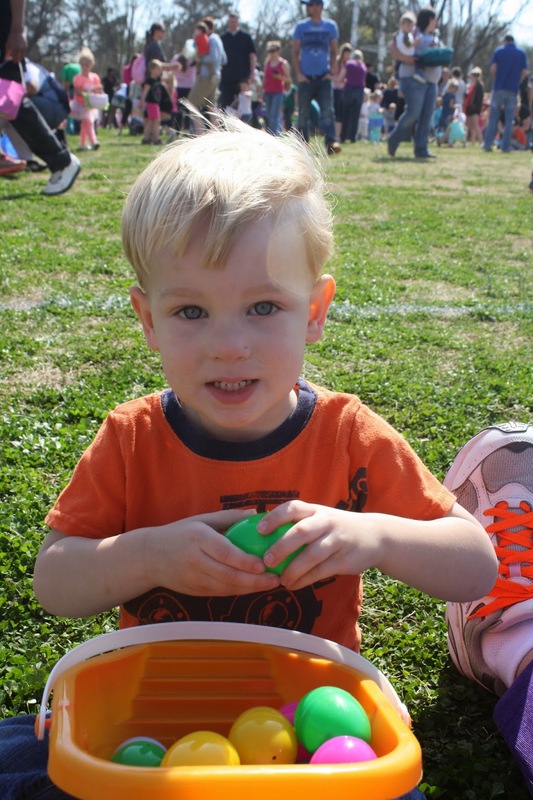 I need to get him a nice Easter basket. Sarah has one, I didn't bring it to this event though. 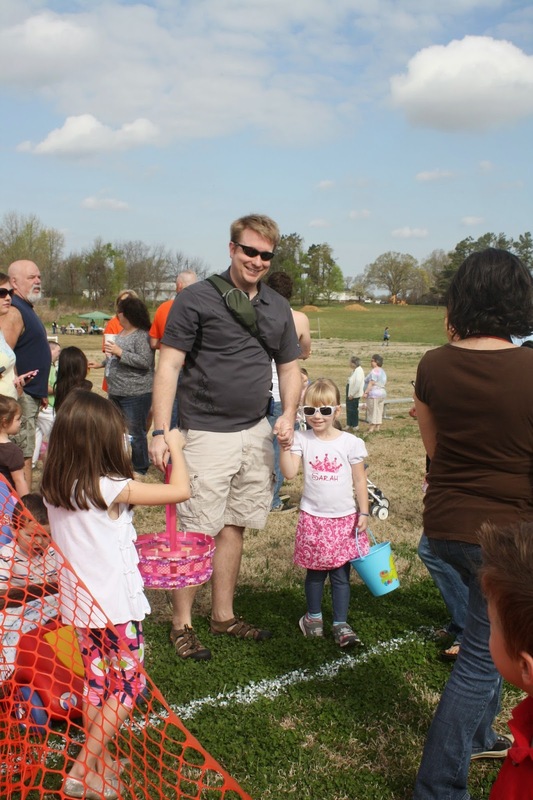 Cody spent a lot of time picking up broken eggs, which I was fan of because that made for less candy I'd have to deal with. 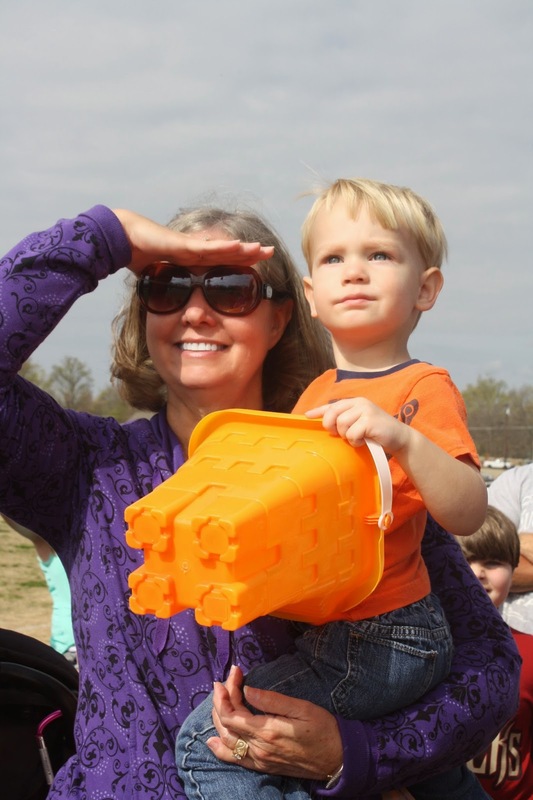 Oh I guess I should mention that the organizers must have known the eggs were going to break open because after the helicopter did it's thing, they divided the fields, and then volunteers went through scattering eggs from big trash bags. So there were actually non broken eggs out on the field. Sarah scrambling to grab eggs. 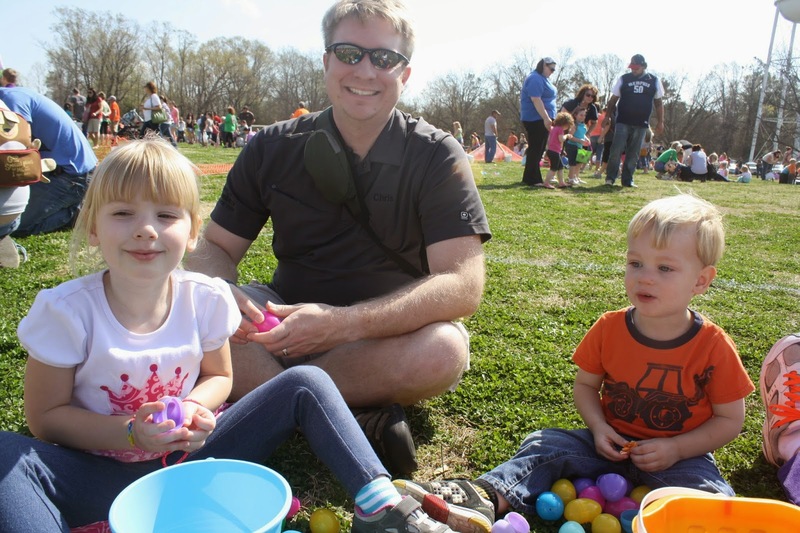 Looking through his eggs to see if he won any prizes. Charlie being only 8 days old slept in the Moby wrap the whole time. 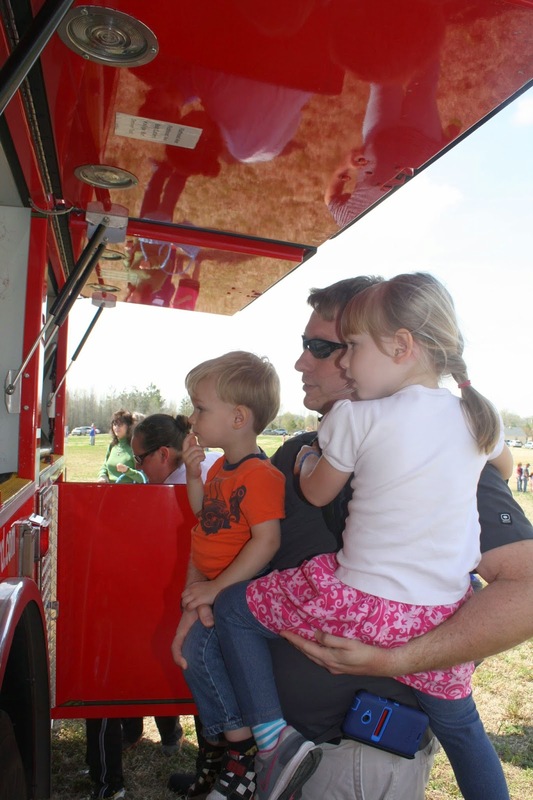 After the egg hunt we headed over to the helicopter and fire truck to climb in and look around. Cody who loves all things airplanes and helicopters and kept telling me he was going to fly the helicopter freaked out when it was his turn to get in. So Chris got in with them. Chris said Cody was terrified the helicopter was going to take off while he was in it. My poor strange child. 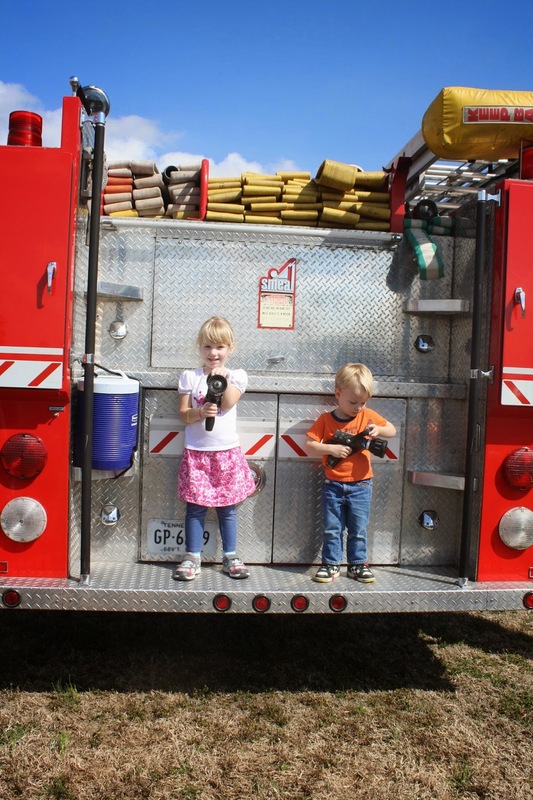 One of the firemen was handing out the sprayer attachment thingy for kids to hold in pictures. Sarah and Cody loved that! Chris explaining all the tools and stuff to the kids. I'm not sure how much of it he actually knew and how much he was just making up. Ha! Oh how cool! I didn't know Munford did this until this year. Someone was talking about it on facebook. 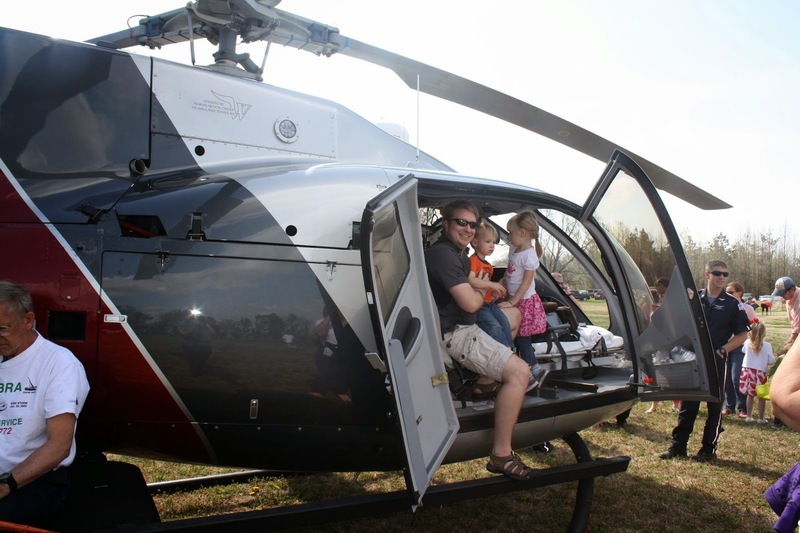 Brooklyn is too big for the egg hunts but I thought the helicopter dropping them was pretty cool. You're killing me, Smalls! I need to see that baby OUT of the moby! Ya cant just skip over the birth story and into Easter, can you? I missed it! That looked like fun, and the weather looked perfect! Hopefully I'll be in the know of these things when we move.